Starting a new business is both a daunting and exciting experience, SO much is going on, your head swirling around with a million ideas and a to-do list that’s longer than a test match. Should the focus be on maintaining a steady cashflow? Or structuring the business to maximise future profits? Often the answer depends on the circumstances of the business, and the needs of the individuals behind it. For just about all intents and purposes, finding a balance between immediate cashflow and building profits should be high on the agenda in the first few years of business. Many businesses start by thinking about how much they can charge for goods or services. On the back of that, they think about how much money they can make if they sell a certain amount of these goods or services. The resulting figure is what’s known as revenue. It’s possible to have excellent revenue and make no profit. It’s also just as possible to have great revenue numbers, make good profits, but have no cash. What you need to remember is that profit is sales, less expenses (excluding GST), whereas cash refers to the net cash available to the business. When starting out, create a plan that covers your potential sales and expenses, how you’ll market your product, and how you’ll deliver it. This plan should result in a financial budget, or forecast, which is used to guide you through your first months and years in business. Of course, this plan is never entirely set in stone. Circumstances change and opportunities arise, but if you have a well thought out plan, different scenarios can be factored in so you’re aware of the impact these changes might have on your business. So, is it profit or cash? With a detailed plan, you’ll then be better informed when it comes to deciding on your focus – profit or cash. Recognising that it takes some businesses time to hit that profitable number, you might find that your initial focus is cashflow. This is about making sure things are running smoothly in the present, rather than banking on future profits. You need to pay for infrastructure. You need to employ staff. You need to buy inventory. All of this needs to happen before you can bring your product or service to market and before the revenue starts to flow in. In this situation, your plan MUST include the ‘hows’ and ‘wheres’ of obtaining funding. If your revenue isn’t going to grow substantially for a while, how will you pay for infrastructure? How will you pay your staff? How will you keep your inventory appropriately stocked? It’s essential to have a good idea of when your revenue will begin to fund your running costs, and then allow for growth. Perhaps your business already has the cash to fund the start up phase, but because you are new to business, you might have to pay in advance for inventory or materials. In this instance, you may be able to shift your focus more towards profit. Alternatively, you might have a business that’s already seeing steady growth. Your customers pay on time, you have great staff, and the opportunity is there for building your revenue. In this case, ask yourself, is your pricing robust enough? Are your delivery methods as efficient as possible? You need to ensure you can take on new customers or sell more products, without compromising your profit margins. Inevitably at this point, you’ll be onboarding new customers, onboarding new staff and employing new resources, and as a result, there’s potential for things to go wrong. A customer has misinterpreted an agreement and is demanding compensation. A staff member doesn’t know what you thought they knew, and has taken twice as long to do the job. Suddenly, your revenue isn’t coming in as planned, despite an increase in sales. Something changes, and your costs are more than what they used to be. Your profit isn’t coming in as expected. Growing too quickly to focus on profit, rather than cashflow, can lead to serious problems. Actually, you should focus on BOTH. As you can see, things in business can change quickly. Opportunities and challenges present themselves constantly. 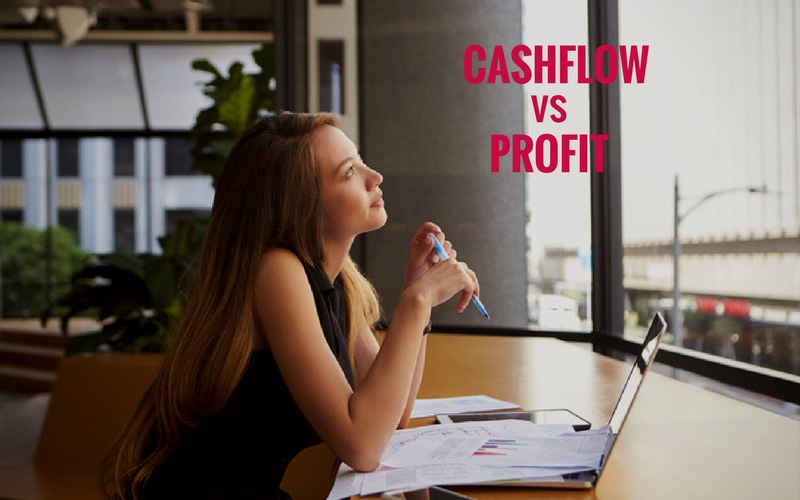 As a result, you should focus on BOTH profit and cashflow so you’re better equipped to take the opportunities as they come and to meet the challenges head on. In order to do this, you must grasp both concepts from the outset – how they relate to each other, and what influences them? Only by understanding the interplay between profit and cashflow can you establish a healthy balance between both.